[XPB-2014] The 14 Door Brass Mailbox System is constructed in solid brass with die-cast doors which include a five (5) pin cylinder cam lock with two (2) keys, a clear 1/4" thick glass window and a nameplate to identify the tenants name and/or box number. The doors are hinged on brass frames and are attached to the individual compartments with four (4) screws. 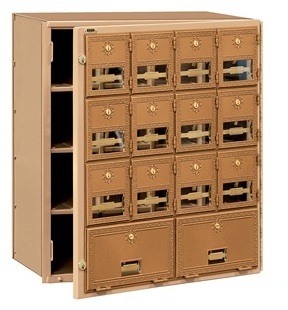 The inside mailbox compartments are constructed of 20 gauge steel and powder coated tan. They are designed to stack two (2) high and mount adjacent to each other or between wall studs. Mailbox units have the same outside dimensions. Rear loading units can also be used in Free-Standing Rotary Mail Centers and Free-Standing Roll-A-Bout Mail Centers. Rear Loading Units have open backs. Hinged locking rear covers (related item XPB-2050) are available as an option. Front Loading Units include solid rear covers. Two (2) master commercial locks with two (2) keys open a door panel that swings on a continuous hinge. All openings are usable.Trim-kits also available. For shipping quotes, orders or questions please call our Customer Service Center at 1-877-483-9270.